Alvarez's AF770CESHB is designed for both clarity of tone and a balanced projection while delivering one of the finest looking guitars at such an affordable price. Its high-quality solid Sitka top and walnut back and sides are the perfect canvas for the stunning shaded Shadowburst which is skillfully applied to the top, back and sides. The AF770CESHB also includes a high-quality pickup and soundhole console with tone and volume wheels, so you're all set for live performances. 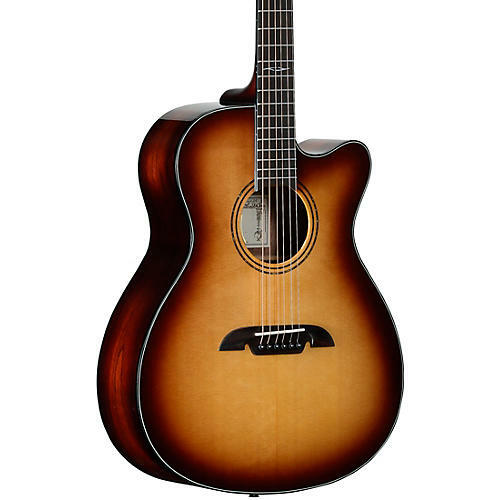 If you're looking for a reasonably priced OM acoustic-electric guitar which sounds and looks like a guitar that is exclusive for those with expandable cash, look no further, the AF770CESHB delivers on all fronts. After 50 years of making guitars, continual improvement through the use of emerging technologies, processes, and materials is still at the heart of Alvarez's culture. Alvarez guitars are constructed correctly in every sense, from raw material preparation to construction and manufacturing processes. Their tonewoods are carefully cured; components, such as neck blocks and wood joints, are carefully designed. The painting, sanding and polishing techniques used are continually researched and developed, and tone is impeccably crafted and married to a stable, consistent and lively sound box. Alvarez believes their multi-award-winning Artist Series is one of the finest solid top guitar lines in the world today and demonstrates their commitment to design. The term “solid top” they use for their guitars refers to the soundboard of an acoustic guitar being made of solid wood, rather than being laminated. However, just because the top is solid, it does not necessarily mean the sound automatically benefits from this feature. The tone of the instrument only improves significantly when the whole guitar is built correctly to optimize the energy a solid soundboard can generate. Artist Series is built to do exactly this. All of Alvarez's tops are carefully selected by their own team and are graded independently of their suppliers. If it isn't worthy, they won’t use it. Top quality improves as you move up the Artist Series models but all are stiff and finely grained. Along with a more angled headstock, their bi-level bridge increases string tension by making the break angle of the strings from the saddle to the top more acute. Improved string tension adds to the sound, feel and response, which are also heightened by the use of real bone nuts and saddles. Artist Series also demonstrates great finishing capabilities; the gloss models have a clear, deep shine from a finish that is applied as thinly as possible, again to help optimize tone.